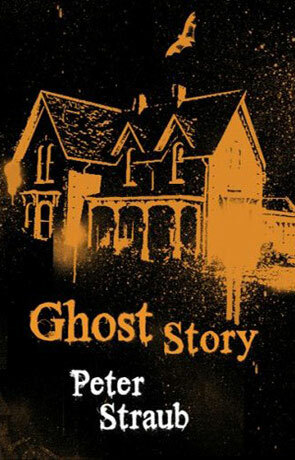 Ghost Story is a tale of horror by Peter Straub. It's hard to review this book without talking about the Chowder Society as most of the story centres around this group of old men and their acquaintances. As we meet the Chowder Society, they are a bunch of old guys who meet every couple of weeks and tell scary stories to each other, but there's more to them than scary stories. As we find out at the CS meet on the one-year anniversary of the dead of one of the (former) Society members, the dead may not have been as natural as one could hope. Moreover, the rest of the Society has had rather freakish nightmares for the last year and on this night they are finally forced to confront each other with their fears. The rest of Ghost Story is a blend of small interlocking stories painting a bigger picture and ever deeper trips into a nightmare world that turns out to be all to real. It's not really a ghost story in the classic sense (no white sheets and no rattling chains), but that doesn't stop it from being rather nightmarish. The problem with Ghost Story is that it's no more than that – rather nightmarish – it's not really scary and it won't leave you laying awake at night or make you look uneasily over you shoulder (unless you are extremely sensitive). Not that it's a bad or boring story, it just isn't a page turner that grips you to the core and forces you to just keep on turning them pages, ignoring everything around you. It picks up in the last quarter of the books and the ending is fairly rewarding and chilling. Other than that it's a very well written book will make a rather nice read if you go at it with the right attitude. I think it's just about the perfect book for reading a few chapters every evening before going to bed – it's wont keep you up all the night, but you will still come back for more.